“Climate change has a potential to disrupt the normal life. Many startling facts and figures regarding the adverse impact of climate change has been reported, hence there is a need to build a natural resilience and media plays an important role in this context, said Sudip Roy Barman Minister Science, Technology & Environment, Government of Tripura. He was speaking at the inauguration of the three- day workshop on climate change, organized by Indian Himalayas Climate Adaptation Programme (IHCAP) of the Swiss Agency for Development and Cooperation (SDC) and Centre for Media Studies (CMS) in collaboration with the Department of Science, Technology and Environment, Government of Tripura. Speaking on the occasion, Roy Barman said, “This kind of media workshop will trigger the interest in reporting climate change and adaptations. Media persons need to equip with the skills required for reporting”. He urged the media to focus more on such issues rather than just reporting on political developments. The objective of the workshop is to brainstorm and share experiences on environment reporting with a special focus on climate change. The three–day event will revolve around the sensitization of media persons in the area of climate change and to engage media persons in dialogues on climate change adaptation. Ashok Kumar, Principal Secretary, Department of Science Technology & Environment, Government of Tripura was also present on the occasion. “This three-day workshop would help in giving the right perspective and generating information on climate change, said Ashok Kumar. Shivananda S Talwar, Director of Department of Science Technology & Environment, Government of Tripura, informed the participants that the State will soon have a vulnerability assessment on climate change in all the eight districts. 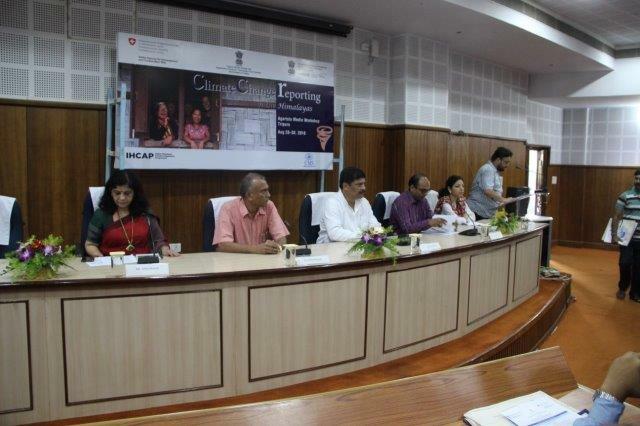 Divya Mohan, Science Policy Officer, IHCAP presented the overview of IHCAP programme. The three-day workshop will include presentations by scientists on the issue of climate change and field visits, to expose participants to community-level impacts and work related to climate change adaptation, and discussion on media-related issues. Media experts are also likely to share their experiences about writing on climate change issues on the last day of the workshop.